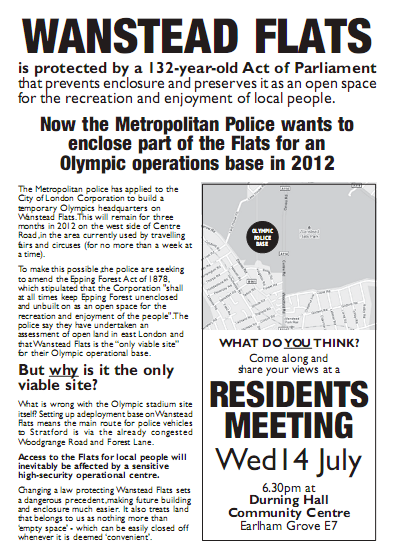 A follow up to the piece I wrote on 14 June about plans by the Metropolitan Police to set up an Olympic operation base on Wanstead Flats. The Metropolitan police has applied to the City of London Corporation to build a temporary Olympics headquarters on Wanstead Flats. This will remain for three months in 2012 on the west side of Centre Road, in the area currently used by travelling fairs and circuses (for no more than a week at a time). To make this possible, the police are seeking to amend the Epping Forest Act of 1878, which stipulated that the Corporation "shall at all times keep Epping Forest unenclosed and unbuilt on as an open space for the recreation and enjoyment of the people". 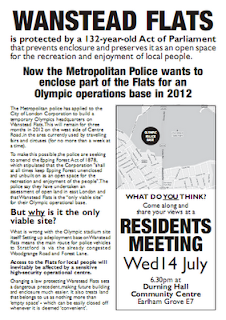 The police say they have undertaken an assessment of open land in east London and that Wanstead Flats is the “only viable site” for their Olympic operational base. But why is it the only viable site? What is wrong with the Olympic stadium site itself? Setting up a deployment base on Wanstead Flats means the main route for police vehicles to Stratford is via the already congested Woodgrange Road and Forest Lane. Access to the Flats for local people will inevitably be affected by a sensitive high-security operational centre. Changing a law protecting Wanstead Flats sets a dangerous precedent, making future building and enclosure much easier. It also treats land that belongs to us as nothing more than ‘empty space’ - which can be easily closed off whenever it is deemed ‘convenient’. If you live in Forest Gate, please come along on 14 July. Anyone who wants to help deliver leaflets, please contact me at copwatcher [at] gmail dot com and I'll pass your details on, although if you just want a few copies to pass on to friends, they should be available from the Durning Hall Community Centre reception in a few days time.